Europe has a dense waterway infrastructure with hard-to-beat road and railway connections. And we’ve got the home advantage! Combine that with the trademark Red Star Forwarding & Logistics passion for cargo, and you’ve got the most (cost-)efficient transport solutions within Europe. A vast network of highways, railroads and inland waterways guarantee smooth transport to all major European markets from the Port of Antwerp. 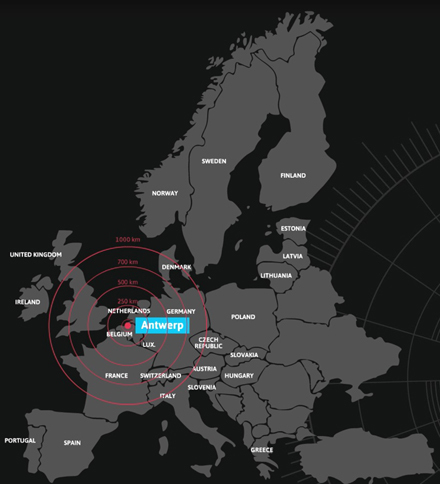 Discover all about Port of Antwerp's strategic location, the excellent transport connections to the European hinterland and the efficient flawless forwarding and expedition services we provide, via one phonecall to Red Star Forwarding: +32(0)3 210 00 20. Try us!